Analyses of global surface temperature maps have allowed researchers at the National Snow and Ice Data Center (NSIDC) to pinpoint the absolute coldest place on Earth – and you won't believe how freakishly frigid it gets. What is the coldest place on Earth? Scientists say it's a place so cold that ordinary mercury or alcohol thermometers won't work there. If you were there, every breath would be painful, your clothing would crackle every time you moved, and if you threw hot water into the air, it would fall to the ground as tiny shards of ice. At this place, the new record of minus 136 F (minus 93.2 C) was set on Aug. 10, 2010. Researchers analyzed data from several satellite instruments and found the coldest place on Earth in the past 32 years is … a high ridge in Antarctica between Dome Argus and Dome Fuji, two summits on the ice sheet known as the East Antarctic Plateau. Temperatures in several hollows were found to dip to the new record. "We had a suspicion this Antarctic ridge was likely to be extremely cold," said Ted Scambos, from the National Snow and Ice Data Center in Boulder, Colorado. "With the launch of Landsat 8, we finally had a sensor capable of really investigating this area in more detail." They used data from the Moderate Resolution Imaging Spectroradiometer (MODIS) instruments on NASA's Terra and Aqua satellites and the Advanced Very High Resolution Radiometer (AVHRR) on several National Oceanic and Atmospheric Administration satellites. These sensitive instruments can pick up thermal radiation emitted from Earth's surface, even in areas lacking much heat. "There's a strong sense that really humans don't have any place there," says Ted Scambos, of the NSDC, in this video from the folks at Goddard Multimedia. "We're talking about temperatures that are 50 degrees colder than anything that has ever been seen in Alaska, or in Siberia, or... in North Dakota or Montana." 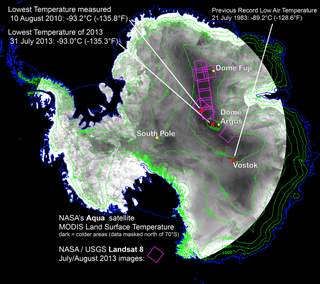 The process by which the coldest place on earth develops its extreme low temperatures.